The BC SPCA has launched an innovative program to accredit dog-training businesses in British Columbia. The AnimalKind program sets out science-based training standards to ensure humane treatment for dogs and peace of mind for their owners. The first six companies to become AnimalKind accredited are Bravo Dog Training & Behaviour Consulting (North Vancouver), Cowichan Canine Behaviour & Training (Duncan), Ethical Canine Training & Behaviour Modification (Victoria), Ocean Park Dog Training (Surrey), Positive Dog (Nanaimo) and Yaletown Dog Training (Vancouver). 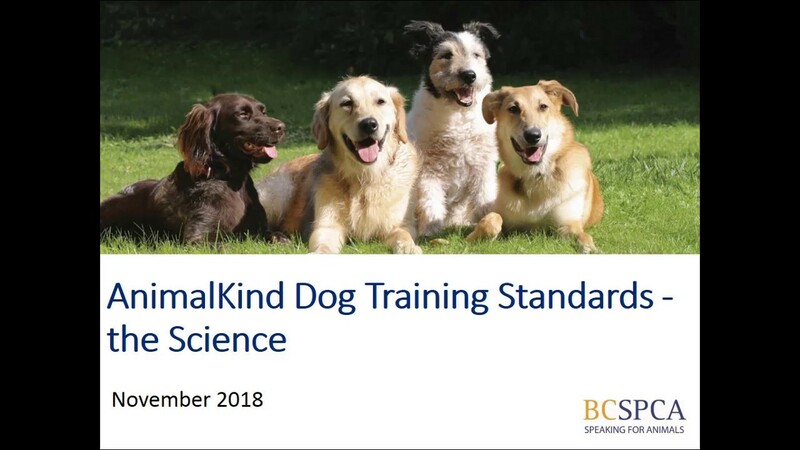 The new AnimalKind standards (PDF) were developed after a thorough review of scientific research, feedback from international animal behaviour and dog training experts, and in-person consultations with 36 dog trainers from B.C. A public comment period was also carried out to gather additional feedback from dog trainers, community veterinarians, animal behaviour associations, kennel clubs service dog organizations and other humane organizations. The standards allow only reward-based, positive reinforcement training and do not include any aversive methods that use punishment, confrontation, intimidation or have the potential to cause physical or psychological harm to the animal. Dr. Dubois notes that most humane organizations and numerous veterinary associations, kennel clubs and dog training associations in North America and internationally have clear position statements supporting the use of reward-based training and opposing the use of aversive methods. Dr. Karen van Haaften, the BC SPCA’s senior manager of behaviour and welfare and a diplomate of the American College of Veterinary Behaviourists, says scientific research across North American and Europe unequivocally supports the use of reward-based training. “There is an extensive body of research comparing dog training methods, and the studies conclude that dogs learn as well or better with positive reinforcement,” she says. “The research also finds that dogs trained with aversive or fear-based methods exhibited negative responses, including increased aggression and a range of stress behaviours during training, such as tensed or lowered body posture, lip licking, yawning, yelping and flattened ears.” She notes that dogs trained with aversive methods often continued to exhibit these stress behaviours when a verbal cue, such as “sit”, was given later on, even when the command was no longer accompanied by the punishment. Says Dr. Dubois: “The goal of AnimalKind is to create a community of animal-related businesses that are committed to using science-based, humane standards, and to help consumers find companies that support good animal welfare.” The SPCA launched the first set of AnimalKind standards – for pest control companies – in 2018. The BC SPCA, Vancouver Foundation and the Peter Wall Institute for Advanced Studies provided funding to establish the program. Learn more about AnimalKind accreditation, or to find a trainer near you.